Parking and Transportation Services (PATS) would like to inform INV permit holders of upcoming changes to the current Rainforest shuttle hours of operation. Effective October 15, the Rainforest shuttle that connects the Lobo Rainforest and UNM main campus, will offer extended hours of operation Monday to Friday, from 7:30 a.m. to 6:45 p.m. 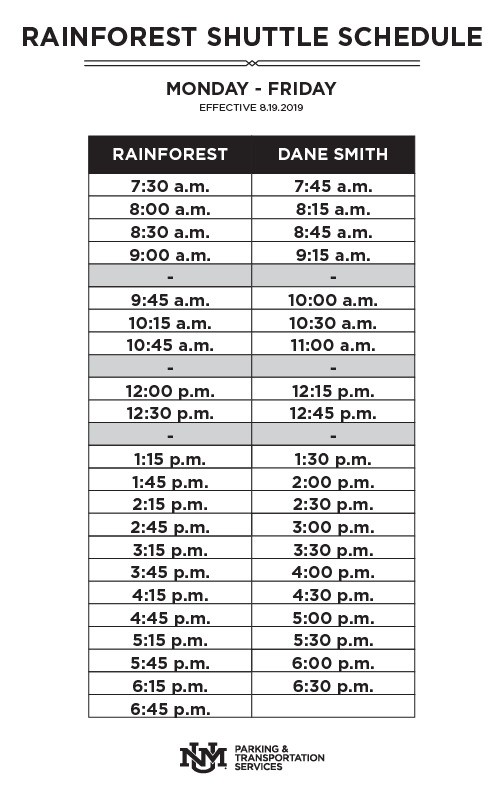 The Rainforest shuttle is scheduled to depart form the Lobo Rainforest parking lot approximately every 30 minutes and arrive at its Dane Smith destination 15 minutes later (traffic dependent). See attached shuttle schedule. In addition to using the Rainforest Shuttle, ABQ Ride, Albuquerque’s public transit system, offers bus lines 66, 766, and 777 with stops on Central Ave. near the Lobo Rainforest and the south edge of UNM’s main campus. You may track the Rainforest shuttle and all UNM and ABQ Ride buses via “Where’s My Bus?” at wmb.unm.edu or by downloading the Lobo Mobile app. For more information of if you have any questions please contact the PATS business office. For news and information, and more fun stuff follow us on our social media!